The way hierarchy structure in an organization reduces the data analytics time as only the managers data have to be analyzed as each manager manages few associates. Therefore less data analysis saves time and hence cost. Most economics theory is based on saving time. Most of the ecommerce startup like online grocery (Food tech startup) or cab aggregators like Uber focus on saving time using mobile apps hence save effort and cost.As Chaos theory focuses on the initial condition of every event meaning that their future behavior is fully determined by their initial conditions, I feel that the IOT scenario is also currently at an initial juncture where we have an opportunity to control the situation before it goes out of hand. There are numerous standards being followed currently in the IOT space to connect various devices but no single global framework is followed. Like the TCP for internet or the IPV4/6 for connectivity which has become the global standard. We have seen the telecommunication and internet revolution simultaneously happening which has fueled various innovations and has made life much more convenient. Even though 2G, 3G, 4G, 5G technologies along with Internet have been globally standardized, the IOT which uses internet as a platform has not yet been standardized. The objective of IOT standardization is to create one language for IOT communication. Standardization will in turn save enormous amount of time and cost. 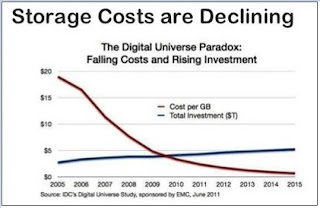 One of the major changes in this space has been triggered due to the declining cost of sensors and cloud storage. 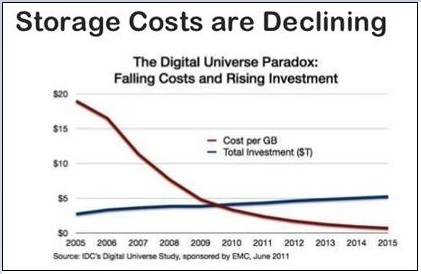 Hence the cost effectiveness has triggered traction in the adoption of this technology. In the world of standardization in IOT, there are many wicked problems. To make people accountable and fix the issues, one standard is imperative. The major challenge is changing requirements as innovation are taking place every day and devices being connected are increasing every day in the IOT space hence difficult to track. One way of reducing cost is by reducing initial research of creating protocols and development cost, maintenance cost by reducing duplication and hence training cost. The benefits of well-planned IOT standardization should overpower the initial investment by a huge margin. Just by having one global standard can solve all these problems. Getting frustrated because of non-availability of right charger for your mobile phone will be a story of the past! There has been very significant shift in new technology adoption. From innovation to adoption of a technology there are series of events that unfold. Before I explain this shift, let me start with a ‘why’ by asking why IOT standardization now? There are 3 reasons why there is a need for standardization of IOT now. 1. 99% devices in the world are not connected. This means that the timing is perfect. Timing was the key for Uber and Airbnb launch and hence the success factor. 2. 50 billion connected devices by 2020 and 2 trillion in revenue means that demand will only rise and hence streamlining is the key. 3. In 2013-14, approximately 2 billion USD invested in IOT startups in Silicon Valley alone. This only shows that the IOT industry is going to be in the early adopter stage. Hence early adopters of common universal standard is crucial right now as the timing is perfect as 1% of devices in the world is currently connected. This is the Gartner Hype cycle which conveys that not all technology made it to the mainstream. All these are from the perspective of an enterprise where consumers have very little role to play in this lifecycle. This underlying theme comes out in both the “Hype Cycle” model used by Gartner since 1995 and the “Technology Adoption Lifecycle” model popularized by Everett Rogers and Geoffrey Moore. Overlaying the hype cycle on the actual consumer adoption is a better way for organizations to make decisions. 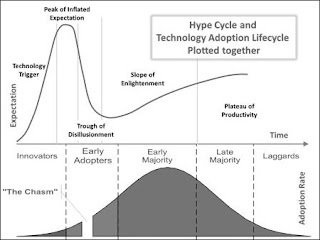 To summarize this figure, the peak of adoption cycle talks about the early majority users and that is the phase when the technology is moving up the slope and is being accepted slowly. In 2015, IOT is in the Peak of Hype cycle and its rapidly being adopted by various industry standards but with chaos and zero strategy for the future compatibility. In the technology adoption space, most of the IOT companies are in the initial start of the curve and hence right time for everyone to follow one platform which can define the end goal. This refusal to adopt a global standard will land all of us in the same problem we have about non-compatibility of various audio and video formats like VHS v/s Betamax issue. The need of the hour is to think long term. Protocols for interoperability have to be standardized for ease of communication. Each sensor generates data which has to communicate with every other device. Different naming and addressing standards will lead to device searching issues. Hence talking to each other in the same language is of prime importance. The narrative of the English language gaining dominance as the global language supports my argument of having a universal IOT language for communication. In the vision of IoT, things have a digital identity (described by unique identifiers), identified with a digital name and the relationships among things can be specified in a digital domain. Some more practical reasons of why IOT standardization would be the most effective way going forward. Is there a real incentive to drive IOT standardization? 1. Interoperability: Breaking IOT products and services into non-interoperable units will hurt the growth of an emerging industry. Unified data exchange format based on context between different industry domains. A unique identifier for an object can translate to a single permanent assigned name named as IOTid for the life of an object. However, there may be need to accommodate multiple identifiers per object, as well as changes to those identifiers. For example, many objects will have a unique identifier assigned by their manufactures. Some may have network addresses (IPv6), as well as temporary local identifiers. We can have an IOTid based on a combination of its IP address as well. It is important that identifiers are not constrained by current choices of technology for storing and communicating unique identifiers or their current limitations, since data carrier technology will evolve. Sensors attached to objects will be individually addressable; their identifiers will be associated with the object via a lookup in a registry. Combinations of things will create “family of tree” identification schemes. 2. Control and Accountability:Chains of responsibility should be clearly established and remedies must be available. Having a hierarchy will exercise centralized control (for example blogs can write whatever about Facebook, twitter but FB is in control of its quality and content). 3. Economical: The economic benefit of standardization can vary significantly between different countries. For example studies show that the impact of standards on annual GDP growth could range from 0.3 to 1 percentage point in different EU member states. Standards are good for international trade because they help lower cost between the seller and the buyer by providing an independent objective set of criteria. 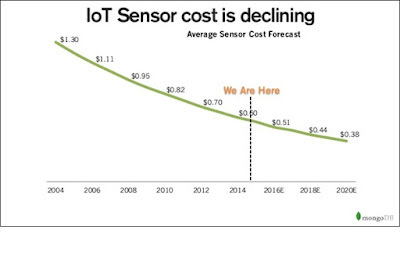 With economies of scale in the manufacturing industry, prices do stabilize and similarly with standardization the IOT products over a period of time will be real cheap. Both the industry as well as consumers will reap the benefit of this. 4. Faster Response: Any issues or complaints can be resolved faster as there will be a clear authority to resolve the conflicts. Hence the users know where to get the work done. When there is a defined set of process and procedures, problems can be solved much faster. Imagine if a crime is committed in an IOT ecosystem, who will be responsible and hence who will respond to it? Technology is mindless; it depends on who uses it! 5. Neutral: Standardization is the voluntary process of developing rules based on consensus among all stakeholders (industry, consumers, public authorities, trade unions etc). Standards also enhance the competitiveness of industry by framing the common requirements upon which a particular IOT product can be built and a hence a level playing field can be ensured by equal representation for all groups. 6. Transparency: Open Governance protects privacy and fundamental rights of users and hence when data moves from one device to other, lots of data analysis happens which can compromise the identity of the people involved. Having one standard and hence an authority can help ensure openness and hence more security. Now talking about the power game of who can influence the standardization process. How standardization will work? Or probably should we be asking will it ever work? To kick start this complex initiative I strongly propose a global campaign for ‘IOTism’. Currently we are witnessing an IOT ecosystem which lacks strong global IPR rules, neutral governance and a balanced participation or representation. The solution to this problem would come from game theory. Without an unbiased authority or a policy maker, it will be impossible to have a truly global IoT ecosystem. Michel Foucault the philosopher said that power comes from multiple sources hence there must be multiple sources of resistance. If we fail to tackle the multiple sources of power, then we risk allowing them to continue to exist and hence multiple source of resistance exists which will create hindrances and hence difficult to control. The tough question we need to ask is why to create an Insecure Internet of Things (IoT)? With this analogy I feel the IOT standardization chaos needs to be tackled with minimum resistance which means making sure there is a common body of influence which can lay the code of conduct of the IOT game. The prison, and its panoptic architecture, was for Foucault a perfect example of these new technologies of power. In the Panopticon, the prisoner can be observed at any time. However, because the observation tower in the middle of the prison is also a source of light, he doesn’t know when he is actually being watched, therefore acts with the assumption of an omnipresent observer. How and what would the governance of the IoT be like? Will it be a state-led agency, or a group under the supervision of the UN, or an industrial consortium? Currently the various power players in the standards world like ITU, ICANN, IEEE, OIC, W3C, ISO, ITEF and industry verticals standard are present who wants to influence a larger pie. Applying Game theory to IOTism for adoption of ONE universal theory – If everyone adopts the standard at the same time, it will be successful. Need of the hour is to bring all institutions together and frame an IOT standard together. Currently by the end of 2015, IOT Industry market is around 0.8 Trillion USD. The true market value of the IOT industry would be created only if there is integration of all IOT standards into just one. If I assume approx. 400 current standards, then IOT standardization value = 0.8/400= 2 Billion. This per capita or per standard value bring down the efficiency of the IOT industry as a whole. Therefore if and only if the IOT standard share is 1, then the IOT market value can be maximized. Let us consider two groups who have their own IOT standard and are trying to lobby or push their standard as global standard. Applying Game theory to this strategic decision, we can find the Nash equilibrium. In this game, both Group A and Group B have a dominant strategy to lobby for pushing their own IOT standard in the industry. It makes sense that if Group A chooses to lobby, and Group B does not, new regulations sought by Group A could put Group B at a competitive disadvantage leading to lower payoffs for Group B. Perhaps if both companies lobby for a common IOT standard, both can carve out some sort of competitive advantage while also protecting themselves to some extent from the lobbying efforts of others. However, there are opportunity costs to lobbying. Expending resources to gain advantages through government intervention is what economists refer to as rent seeking. It may be the case that if both would abstain from lobbying their own standard, those resources could be devoted to R&D efforts that would actually yield greater returns, improved marketing to consumers, or other benefits leading to higher payoffs for both players. Hence having a common framework will reduce the effort of lobbying and hence concentrate more on the product to market for consumers. The solution to this is really thinking out of this box and bring another angle of both the Groups A & B pushing a universal common IOT framework simultaneously. This would be beneficial to everyone when multiple stakeholders are involved. Hence lobbying one common universally accepted IOT standard is the only solution which should be accepted simultaneously by all the major power groups. This group should be represented by the corporates, establishments and standard organizations altogether working in unison to push a common standard for IOT. For the sake of argument let us compare the Information age versus banking system. Banking is regulated today. Hence banking system is trusted. Whereas information and internet is not trusted today and hence IOT will not be trusted if there is no regulation control and monitoring. If an ecosystem of support along with regulation is provided then the whole IOT system will be successful. Currently various standard exists and hence there is no monitoring done. Standardization will bring in monitoring. Therefore, all country, agencies collectively would apply game theory of one standard at the same time. Hence IEEE, ISO, ITU, ICANN, W3C power war, various industry vertical standards like healthcare, financial sector, manufacturing etc all should adopt a common standard framework. One of the ways of approaching this is accepting the commonalities of the already existing silo standards and framing the base foundation of the framework through global alliance of standards. To make sure any revisions of the frameworks can be done, we need to provide a boundary and hence I propose an IOT TRUST framework. The way a Governance Risk and Compliance (GRC) Automation platform or tool in Cyber security space has a basic foundation which has workflow, dashboard, application linking, access and role management etc and any use case or application module can sit on top of it. Similarly IOT TRUST foundation could be common globally. Any organization/industry is free to map their customized processes on top of the base foundation framework. This will control the input and output of data. Hence achieving a universal standard and a contextual technology layer wrapped on top of it. Also it is imperative to understand that once the IOT standardization is achieved, there should be a smooth transition strategy like a migration roadmap plan for the previous standards (currently approximately 450 IOT standards exists) and not just leave on the market to decide the adoption. The responsibility of this group would be to think ahead of the curve and make the necessary changes to the framework to be compatible and accommodative for future innovations. IOT is an extension to human organs and hence the game of IOTism to ORGANism should be played very responsibly. We should keep in mind what happens to humanity when there is technological singularity! Else the next world war could be fought over standard Information of Things!